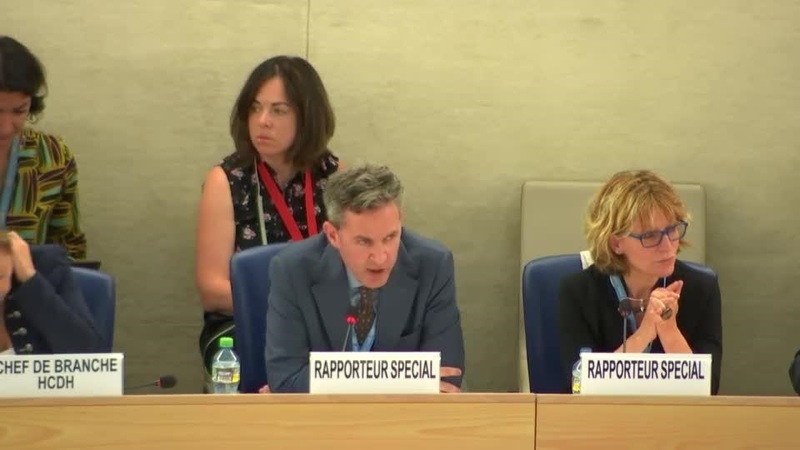 On 19 June, David Kaye, the UN Special Rapporteur on the promotion and protection of the right to freedom of opinion and expression, who is from the United States, demonstrated to the Council [OHCHR reporting and documents here] through the presentation of principle findings from his country missions to Mexico and Liberia concerns regarding safety of journalists and the need to protect and promote the media. This was also the subject of a side event to the Council held on 22 June, at which Kaye spoke again (see below). Kaye further pointed out that on 1 July, Mexico will hold “one of the most extensive sets of elections in its history.” Hence, to achieve free and fair elections in Mexico during this period, it is important to ensure the security of those reporting on issues of the highest public importance in the country, thereby reinforcing Mexico’s democracy, he said. On a recent mission he took to Liberia, Kaye highlighted the progress Liberia has made regarding building and strengthening of its democracy. He demonstrated that part of this progress for Liberia is the establishment of a society where the media is vibrant and often critical. He added that Liberia’s commitment to freedom of expression deserves support and encouragement of all sectors of the Liberian society and the international community. A similar subject on protection of journalists and freedom of expression in Mexico was also discussed at a side event on 22 June alongside the ongoing Human Rights Council. The event brought together leading experts on human rights including Kaye. They spoke on the situation of freedom of expression and safety of journalists in Mexico. According to Kaye, there is need for improvement of protection of journalists on the one hand and accountability on the other hand. Kaye and Luis Fernando García, executive director, R3D Red en Defensa de los Derechos Digitales, pinpointed the issue of government digital surveillance of journalists. The investigation of such surveillance lacks fundamental independence and does not integrate the expertise from outside that it should, said Kaye. García added that there are several irregularities with the way surveillance is being used in Mexico, which have been documented. He emphasised the need for independent investigation and reform. She further said that ARTICLE 19 has been focused on these killings and can almost confirm that these killings are linked with the journalists’ journalistic works. She mentioned that a total of 23 journalists have disappeared since 2001 and said that there is evidence that at least 45 percent of the perpetrators of these attacks are public officials. According to Gutiérrez, it is always said that there are no political motives related to the killing of journalists in Mexico, this is challenging to ascertain because if the state is not willing to recognise the link between the killings and the work of journalists, there will not be advances in investigation and prosecution. Damilola Adepeju may be reached at info@ip-watch.ch. "Human Rights Council Examines Safety Of Journalists And Protection Of Media" by Intellectual Property Watch is licensed under a Creative Commons Attribution-NonCommercial-ShareAlike 4.0 International License.